The soft, cloth-like feel of Naty disposable diapers provide an excellent, non-bulky fit from newborn to toddler, and the quality is constantly top ranked among parents. In addition, ECO diapers are completely unbleached, contain no latex, fragrance, or TBT (tributyltin), and are hypoallergenic. Have you actually taken the time to make educated choices when it comes to disposable baby diapers? Have you read about how chemicals and synthetics are affecting our planet and your baby's sensitive skin? Are you are one of the curious ones, determined to make a change for the better? Then you can become a Naty Ambassador. 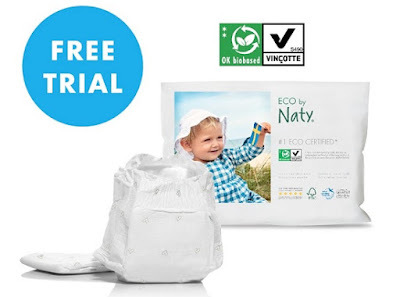 When you become a Naty Ambassador, you will receive free Certified ECO Nappy Samples, sent to your home free of charge!